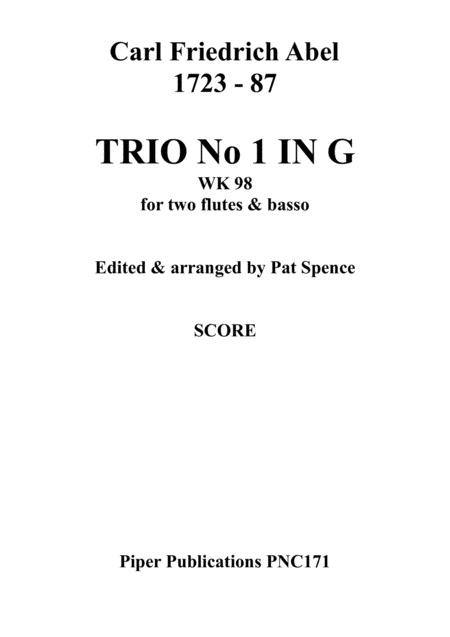 This is the first of four trios that Abel composed in 1785 for the Earl of Abingdon for two flutes and basso. There are three movements, Moderato, Adagio ma non troppo and Allegretto. 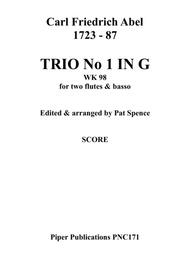 The parts are not difficult and the trios were published with the Earl's permission with the expectation that they would be played by amateurs making music at home. The flute parts were deemed suitable also for oboes or violins and the basso part by either a bassoon or cello. In 1762 Abel's friend J. C. Bach had introduced the clarinet to London audiences and it is quite likely that a clarinet may have played the second flute part since the early clarinets were pitched in C. With this in mind I have included alternative clarinet parts in Bb in the set of parts to increase the versatility of this piece.